When a magnet falls through a ring, current is induced in the ring. This phenomenon is called electromagnetic induction. The voltage induced when a magnet is falling through a ring is simulated in this experiment, where we model the magnet as a magnetic 'dipole'. The current is visualized by very big 'electrons' that move according to the strength of the current. 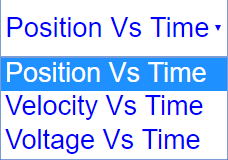 How could you change the simulation to increase the magnitude of the signal? Toggling this box will toggle which graph to display. Toggling this will toggle if the ring is cooled or not. Toggling between this button will flip the magnet accordingly. Changing this will change the size of the ring. Toggling this will toggle the visibility of the free falling ball. 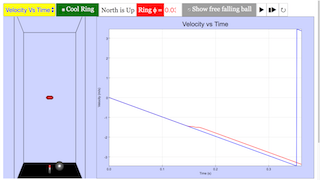 Note that the graphs will also plot those of the free falling ball if checked on. Note that it won't work if the simulation is running.